The essential quality of paint is that it is marvelously liquid! 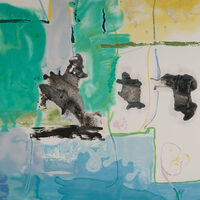 Following Helen Frankenthaler's lead in her piece "West Wind," we'll stain paper and fabric with fluid paint. Seats are limited to 15 participants. Registration will open at noon on the Friday before the session. Visit to www.thegundgallery.org/events/pm-atelier-pour to register. Image: Helen Frankenthaler (American, 1928 – 2011), "West Wind," 1996. Silkscreen in 37 colors. 41 1/4 x 35 1/2 inches. Gund Gallery Collection; gift of Mr. and Mrs. Graham Gund ’63.